"I happen to believe that photography is not about black and white; it’s about grays. [. . .] A photographic scale has no edge; it’s a smooth transition from white to black, and it’s certainly not digitized. The standards that have been set for photography are essentially standards that the manufacturer imposed on the process. And it was the manufacturers who said that a negative has to be a certain way, has to have this, that, and the other to be viable, but I don’t believe in that. I believe that what I say is correct, and when I want a picture, I don’t care how dark it is. I believe that if I feel something, and I have my camera, I should try to capture it. [. . .] So I don’t ever allow the process to limit me. When it comes down to it, I love looking at those dark tones and the grays. It’s so sensuous to me." 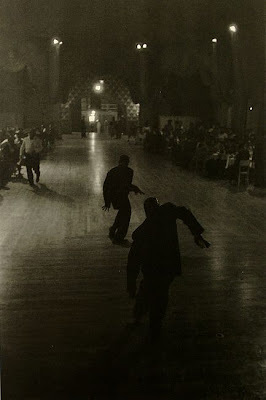 "This photograph was taken at a dance of a social club at the 110th St. Manor at Fifth Avenue. It is about the intermission where they had entertainment and the entertainment was two dancers who danced to jazz music. That’s what this image is all about; it’s about these two dancers who represent a terrible torment for me in that I feel a great ambiguity about the image because of them. It’s because they are in some ways distorted characters. What they actually are is two black male dancers who dance in the manner of an older generation of black vaudeville performers. The problem comes because their figures remind me so much of the real life experience of blacks in their need to put themselves in an awkward position before the man, for the man; to demean themselves in order to survive, to get along. In a way, these figures seem to epitomize that reality. And yet there is something in the figures not about that; something in the figures that is very creative, that is very real and very black in the finest sense of the word. So there is this duality this ambiguity in the photograph that I find very hard to live with. I always have to make a decision in a case like this – is it good or is it bad? I have to say that even though it jars some of my sensibilities and reminds me of things that I would rather not be reminded of, it is still a good picture. In fact, it is good just because of those things and in spite of those things. The picture works." N.B. : The first three quotations in this post are taken from Dread Scott "An Interview with Roy DeCarava," A Gathering of the Tribes #7 (undated, seemingly 1996) which you can find here. 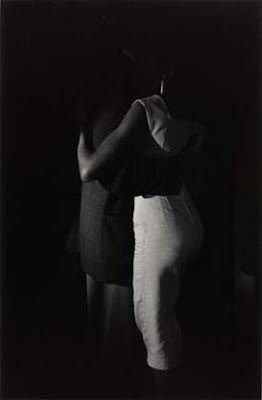 The final one is from a series of interviews with Sherry Turner DeCarava published in Roy DeCarava Photographs (1981). The Dread Scott interview link didn't work.